A friend to many of us at Things Above Us, and to many of our readers as well, died suddenly on December 4, 2018. Donna Guy, also known as “The Kindness Ninja” or Twitter was a warm, loving, and eminently kind older woman whose relentless pursuit in life was to encourage and uplift her brothers and sisters in Christ. She will be terribly missed by many of us and her loss leaves both an emptiness that weighs upon our small niche of friends, and a legacy to be fulfilled. As our friend Dave mused in his own touching remembrance, I don’t remember how I ever came to know Donna. I must have met her when I met many of the other brothers and sisters via Twitter. I remember logging onto Twitter in my early days to follow baseball tweets during games. I ended up speaking out about a Christian controversy du jour, and suddenly I knew people like Gabe Hughes, Nate Pickowicz, and Michelle Lesley, along with a gaggle of various other good and godly folks. I met many of my fellow bloggers like Garrett and Tim this way (Michael and I met offline, before Twitter). Donna must have been in that gaggle. Soon enough, my mentions on any given weekday were nearly worthless as she’d cram in as many of us as she could simply to say “Happy Wednesday” or whatever day it was. All of the retweets, favorites, and replies on such a large thread became, as Dave mentioned, mildly annoying and a subtle reminder of a woman who both tried and, with some success, became involved in people’s lives; having a positive effect. On occasion, she’d include me and others here at TAU in a “follow Friday” tweet which had similar effects. I struggle to think what it would have taken to keep Donna out of your life. She was unwavering in her pursuit to make you smile and help you feel loved. When people examine George Mueller, they don’t need to be told that he saw orphans as his mission in life. Similarly, when people met Donna, no one needed it explained that her mission was to love as warmly and as often as possible, no matter who you were. Her reasons were also quite evident to anyone that got to know her. Quite simply, she loved Jesus Christ. She exalted Him, she defended Him, and to the fine details — as far as I or anyone could tell — she sought to be just like Him. What a testimony. What a legacy. On a personal level, I was particularly touched by Donna’s care for me. I can be a prickly old curmudgeon with a glass half empty sort of outlook. I like to call myself a realist, and sometimes I think that’s true, but sometimes it’s not. My personality is nothing like that of my friend Donna, and yet, she didn’t mind our differences. She wasn’t like that. She didn’t have filters for people. She just saw a believer before her?— saw a person before her — and decided to be a positive person in their life. The church could use thousands more like her. It could use her discernment too. As a curmudgeonly realist, the problem I often have with optimists and with those whose manner in life it is to encourage is often they do so thoughtlessly, and more often than not they end up encouraging bad things along with the good. It becomes a real problem because it, in fact, dilutes the effect of the encouragement. When you encourage sin or foolishness, it’s hard to come alongside that same person and be an encouragement in the misery that will surely follow. It’s reckless evil, not relentless good. Donna had no such issues. Hidden behind the “Happy Wednesday! !” tweets and the “follow Friday” rendering your notifications useless for the day was a wise person sending them to people who sought to do good things. It was a mind that knew truth and heart that knew Jesus. It was a woman using her gift of encouragement for good. So it was evangelists, pastors, teachers, stay-at-home moms, ministry leaders, missionaries, seminary students, and even lowly foster parents like me who benefited from our sweet friend. She was a sharp arrow ready to be drawn back by her Lord, and through her, God hit His mark several times. 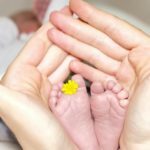 If you read this blog, you know that I am a foster parent. I love those kiddos, and I treasure them more than words can describe. To be sure, my wife and I have friends that encourage us, labor alongside us, check in on us, and generally are a blessing to our lives. I could name several people in our families who fit this description. There are many in our church who do more than their fair share. My fellow bloggers are a constant encouragement?— particularly Michael who is a most treasured friend. However, from all the way down in Florida, through the crazy and often harrowing hellscape that is Twitter, despite never having met the children nor my family and despite never having the chance to be rewarded in this life, there was Donna. Checking in on me, rejoicing with me over even their little moments, crying with me over the often crushing bad days, and making a general fuss over cute pictures and even cuter things they’d say. She loved them, she loved hearing about them, and she loved us. I cannot describe what that meant to me. Donna had a tradition. 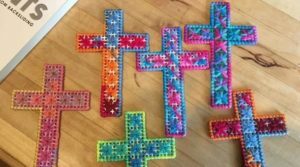 She would send knitted crosses to the people she loved. I’m sure some reading this have their own from her. I have mine in the drawer of my desk. They served as a tangible token and a reminder of her encouragement. 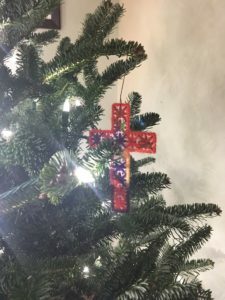 Donna made one of these crosses for each of the foster children we’ve had in our home. I still remember telling Donna about how our first little guy — whom we love and still miss — took his with him when he left our home. She was so thrilled to hear of it. My current group of kids received a package from her a few weeks after they moved in. Foster children are people who often don’t experience kindness. To receive those gifts, sent to them by someone who loved them and expected nothing in return, made a powerful impact on their young lives. I remember distinctly that my 7-year-old daughter had a difficult time reconciling why someone would do such a thing; trying to figure out what this person wanted from her. She didn’t want anything, little one; other than for you to smile and know you were loved. As I said in my opening paragraph, Donna leaves a legacy behind. A legacy of kindness and encouragement that should, but often does not, mark every believer. Her legacy is of relentless love and care for average everyday believers who often do nothing in return. She tried to love like Jesus loved and her effort should be a motivation to us all. As many of us mourn her death today, let our tears and our sadness instill in us her drive to be more like her Lord, to care for others as was her passion, and to serve the God she had very clearly decided was worthy of devoting her life. The church needs more of the warmth and fellowship that Donna embodied, and certainly more of the mindfulness of others that was Donna’s extraordinary talent. I believe I can speak for the team at Things Above Us in saying we will miss Donna tremendously; and also that we believers are not those who mourn without hope. We will see Donna again, serving her glorious Lord and resting forever in His compassionate care. What comfort it is to think of her there, and how we long to join her when our Lord takes us home too. In honor of our mutual friend, we at Things Above Us invite you to share your own memories of Donna in the comments of this post. Wow. I am so saddened to read this. She has prayed for me on numerous occasions, not to mention all the encouragement she brought to all. Her attitude was contagious. I haven’t been on Twitter in a long time so I wouldn’t have known except by this post. Thanks Jason for posting this.